I saw The Fighter yesterday afternoon. 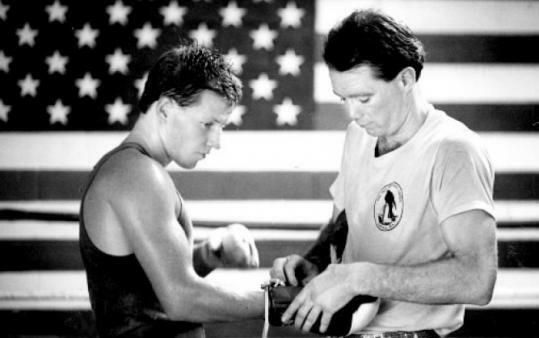 The film is a biopic about “Irish” Micky Ward fighting out of Lowell, MA starring Mark Wahlberg as Micky Ward, Christian Slater as his brother Dicky Eklund, Amy Adams as Micky’s girlfriend Charlene Fleming and Melissa Leo in the role as Dicky and Micky’s mother Alice. The movie follows some of the formulaic aspects of boxing genre films, such as triumph over adversity, but at its heart the film is about families and what happens when love is applied as an imperfect reflection of how people feel about themselves and each other. It got me to thinking about why people box in the first place — and the kind of heart and mental fortitude it takes to get kicked down over and over, only to keep coming back; not only to get it right, but to say something about oneself. In essence, the boxer is there to say, “I matter,” in the world. Not to say that boxers or anyone who chooses to test themselves in that way necessarily comes from violent homes where “love” is equated with beatings or being pitted against one’s siblings or being taken on emotional roller coaster rides, but it does seem to say that one needs to test one’s inner strength — and in that affirmation overcome whatever demons large or small may impede one’s ability to feel whole without that sort of test. As a boxer I know once said, “any punishment I ever took in the ring was a damned sight less than what I got every Saturday night from my old man” — and yet he still found himself playing out his ability to overcome that abuse to come out on the other side as a fully intact human being. Perhaps because it is Christmas and this is my first holiday season after losing my mother, I feel particularly sensitive to the notion that families propel us to so much of what we do in our lives. And whether it is into the ring or some other form of physical or mental test of one’s mettle, in the end we do get to not only affirm that we matter, but to say that how we express those feelings has meaning. This is a long way of saying that The Fighter is a good film worth seeing if not for the star power than for the fact that it attempts and succeeds at telling a very honest story about being human. Margaret Reyes Dempsey suggested I drop over and read your review. I’ve heard good things about The Fighter and it’s on my list of movies to see. It’s interesting to see a movie reviewed by someone who knows the subject matter rather than the medium, which is what you usually end up reading. I don’t have an interest in boxing, to be honest, but I adore movies and especially those that portray ‘the human element’. After all, when you talk about ‘the kind of heart and mental fortitude it takes to get kicked down over and over, only to keep coming back; not only to get it right, but to say something about oneself’, that sounds like life itself as much as boxing.